For other people named Housman, see Housman (surname). Alfred Edward Housman (/ˈhaʊsmən/; 26 March 1859 – 30 April 1936), usually known as A. E. Housman, was an English classical scholar and poet, best known to the general public for his cycle of poems A Shropshire Lad. Lyrical and almost epigrammatic in form, the poems wistfully evoke the dooms and disappointments of youth in the English countryside. Their beauty, simplicity and distinctive imagery appealed strongly to Edwardian taste, and to many early 20th-century English composers both before and after the First World War. Through their song-settings, the poems became closely associated with that era, and with Shropshire itself. Housman was one of the foremost classicists of his age and has been ranked as one of the greatest scholars who ever lived. He established his reputation publishing as a private scholar and, on the strength and quality of his work, was appointed Professor of Latin at University College London and then at the University of Cambridge. His editions of Juvenal, Manilius and Lucan are still considered authoritative. Home of A.E. Housman from 1860-1873 and again from 1878-1882. His younger brother Laurence was born here in 1865. The eldest of seven children, Housman was born at Valley House in Fockbury, a hamlet on the outskirts of Bromsgrove in Worcestershire, to Sarah Jane (née Williams, married 17 June 1858 in Woodchester, Gloucester) and Edward Housman (whose family came from Lancaster), and was baptised on 24 April 1859 at Christ Church, in Catshill. His mother died on his twelfth birthday, and his father, a country solicitor, remarried, to an elder cousin, Lucy, in 1873. Two of his siblings became prominent writers, sister Clemence Housman and brother Laurence Housman. Housman was educated at King Edward's School in Birmingham and later Bromsgrove School, where he revealed his academic promise and won prizes for his poems. In 1877 he won an open scholarship to St John's College, Oxford and went there to study classics. Although introverted by nature, Housman formed strong friendships with two roommates, Moses John Jackson (1858 – January 14, 1923) and A. W. Pollard. Though Housman obtained a first in classical Moderations in 1879, his dedication to textual analysis, particularly of Propertius, led him to neglect the ancient history and philosophy that formed part of the Greats curriculum. Accordingly, he failed his Finals and had to return humiliated in Michaelmas term to resit the exam and at least gain a lower-level pass degree. Though some attribute Housman's unexpected performance in his exams directly to his unrequited feelings for Jackson, most biographers adduce more obvious causes. Housman was indifferent to philosophy and overconfident in his exceptional gifts, and he spent too much time with his friends. He may also have been distracted by news of his father's desperate illness. After Oxford, Jackson went to work as a clerk in the Patent Office in London and arranged a job there for Housman too. The two shared a flat with Jackson's brother Adalbert until 1885, when Housman moved to lodgings of his own, probably after Jackson responded to a declaration of love by telling Housman that he could not reciprocate his feelings. Two years later, Jackson moved to India, placing more distance between himself and Housman. When he returned briefly to England in 1889, to marry, Housman was not invited to the wedding and knew nothing about it until the couple had left the country. Adalbert Jackson died in 1892 and Housman commemorated him in a poem published as "XLII – A.J.J." of More Poems (1936). Meanwhile, Housman pursued his classical studies independently, and published scholarly articles on such authors as Horace, Propertius, Ovid, Aeschylus, Euripides and Sophocles. He gradually acquired such a high reputation that in 1892 he was offered and accepted the professorship of Latin at University College London (UCL). When, during his tenure, an immensely rare Coverdale Bible of 1535 was discovered in the UCL library and presented to the Library Committee, Housman (who had become an atheist while still an undergraduate) remarked that it would be better to sell it to "buy some really useful books with the proceeds". Although Housman's early work and his responsibilities as a professor included both Latin and Greek, he began to specialise in Latin poetry. When asked later why he had stopped writing about Greek verse, he responded, "I found that I could not attain to excellence in both." In 1911 he took the Kennedy Professorship of Latin at Trinity College, Cambridge, where he remained for the rest of his life. G. P. Goold, Classics Professor at University College, wrote of Housman's accomplishments: "The legacy of Housman's scholarship is a thing of permanent value; and that value consists less in obvious results, the establishment of general propositions about Latin and the removal of scribal mistakes, than in the shining example he provides of a wonderful mind at work … He was and may remain the last great textual critic." Between 1903 and 1930 Housman published his critical edition of Manilius's Astronomicon in five volumes. He also edited works by Juvenal (1905) and Lucan (1926). His younger colleague A. S. F. Gow quoted examples of these attacks, noting that they "were often savage in the extreme". Gow also related how Housman intimidated his students, sometimes reducing the women to tears. According to Gow, Housman (when teaching at University College London where, unlike Cambridge, he had students of both sexes) could never remember the names of his female students, maintaining that "had he burdened his memory by the distinction between Miss Jones and Miss Robinson, he might have forgotten that between the second and fourth declension". One of Housman's notable pupils at Cambridge was Enoch Powell. In his private life Housman enjoyed gastronomy, flying in aeroplanes and making frequent visits to France, where he read "books which were banned in Britain as pornographic". But he struck A. C. Benson, a fellow don, as being "descended from a long line of maiden aunts". His feelings about his poetry were ambivalent and he certainly treated it as secondary to his scholarship. He did not speak in public about his poems until 1933, when he gave a lecture "The Name and Nature of Poetry", arguing there that poetry should appeal to emotions rather than to the intellect. 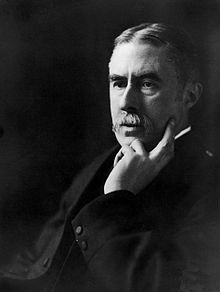 Housman died, aged 77, in Cambridge. His ashes are buried just outside St Laurence's Church, Ludlow, Shropshire. During his years in London, A. E. Housman completed A Shropshire Lad, a cycle of 63 poems. After one publisher had turned it down, he helped subsidise its publication in 1896. At first selling slowly, it rapidly became a lasting success. Its appeal to English musicians had helped to make it widely known before World War I, when its themes struck a powerful chord with English readers. The book has been in print continuously since May 1896. The poems are marked by pessimism and preoccupation with death, without religious consolation. Housman wrote many of them while living in Highgate, London, before ever visiting Shropshire, which he presented in an idealised pastoral light as his 'land of lost content'. Housman himself acknowledged that "No doubt I have been unconsciously influenced by the Greeks and Latins, but [the] chief sources of which I am conscious are Shakespeare's songs, the Scottish Border ballads, and Heine." Housman began writing a new set of poems after the First World War. He was an influence on many British poets who became famous by their writing about the war, and wrote several poems as occasional verse to commemorate the war dead. This included his Epitaph on an Army of Mercenaries, honouring the British Expeditionary Force, an elite but small force of professional soldiers, 'a rapier amongst scythes' sent to Belgium at the start of the war. Fighting a well-equipped and much larger German army, they suffered heavy losses. In the early 1920s, when Moses Jackson was dying in Canada, Housman wanted to assemble his best unpublished poems so that Jackson could read them before his death. These later poems, mostly written before 1910, show a greater variety of subject and form than those in A Shropshire Lad but lack the consistency of his previously published work. He published them as Last Poems (1922), feeling that his inspiration was exhausted and that he should not publish more in his lifetime. After his death Housman's brother, Laurence, published further poems in More Poems (1936), A. E .H. : Some Poems, Some Letters and a Personal Memoir by his Brother (1937), and Collected Poems (1939). A. E. H. includes humorous verse such as a parody of Longfellow's poem Excelsior. Housman also wrote a parodic Fragment of a Greek Tragedy, in English, published posthumously with humorous poems under the title Unkind to Unicorns. Poetry was for him …'a morbid secretion', as the pearl is for the oyster. The desire, or the need, did not come upon him often, and it came usually when he was feeling ill or depressed; then whole lines and stanzas would present themselves to him without any effort, or any consciousness of composition on his part. Sometimes they wanted a little alteration, sometimes none; sometimes the lines needed in order to make a complete poem would come later, spontaneously or with 'a little coaxing'; sometimes he had to sit down and finish the poem with his head. That... was a long and laborious process. Sparrow himself adds, "How difficult it is to achieve a satisfactory analysis may be judged by considering the last poem in A Shropshire Lad. Of its four stanzas, Housman tells us that two were 'given' him ready made; one was coaxed forth from his subconsciousness an hour or two later; the remaining one took months of conscious composition. No one can tell for certain which was which." Goodbye, said you, forget me. His poem "Oh who is that young sinner with the handcuffs on his wrists? ", written after the trial of Oscar Wilde, addressed more general attitudes towards homosexuals. In the poem the prisoner is suffering "for the colour of his hair", a natural quality that, in a coded reference to homosexuality, is reviled as "nameless and abominable" (recalling the legal phrase peccatum illud horribile, inter Christianos non nominandum, "that horrible sin, not to be named amongst Christians"). Housman's poetry, especially A Shropshire Lad, was set to music by many British, and in particular English, composers in the first half of the 20th century. The national, pastoral and traditional elements of his style resonated with similar trends in English music. In 1904 the cycle A Shropshire Lad was set by Arthur Somervell, who had begun to develop the concept of the English song-cycle in his version of Tennyson's Maud a little previously. Ralph Vaughan Williams produced his well-known settings of six songs, the cycle On Wenlock Edge, for string quartet, tenor and piano in 1909. Between 1909 and 1911 George Butterworth produced settings in two collections, Six Songs from A Shropshire Lad and Bredon Hill and Other Songs. He also wrote the orchestral tone poem A Shropshire Lad, first performed at Leeds Festival in 1912. Ivor Gurney was another composer who made renowned settings of Housman's poems. Towards the end of World War 1 he was working on his cycle Ludlow and Teme, for voice and string quartet (published in 1919), and went on to compose the eight-song cycle The Western Playland in 1921. One more who set Housman songs at this period was John Ireland in the song cycle, The Land of Lost Content (1920–21). Even composers not directly associated with the 'pastoral' tradition, such as Arnold Bax, Lennox Berkeley and Arthur Bliss, were attracted to Housman's poetry. A 1976 catalogue listed 400 musical settings of Housman's poems. As of 2016, Lieder Net Archive records 606 settings of 187 texts. This inscription commemorates Alfred Edward Housman, who was for twenty-five years Kennedy Professor of Latin and Fellow of the College. Following in Bentley's footsteps he corrected the transmitted text of the Latin poets with so keen an intelligence and so ample a stock of learning, and chastised the sloth of editors so sharply and wittily, that he takes his place as the virtual second founder of textual studies. He was also a poet whose slim volumes of verse assured him of a secure place on the British Helicon. He died on 30th April 1936 at the age of seventy-six. From 1947, University College London's academic common room was dedicated to his memory as the Housman Room. Blue plaques followed later elsewhere, the first being on Byron Cottage in Highgate in 1969, recording the fact that A Shropshire Lad was written there. More followed on his Worcestershire birthplace, his homes and school in Bromsgrove. The latter were encouraged by the Housman Society, which was founded in the town in 1973. Another initiative was the statue in Bromsgrove High Street, showing the poet striding with walking stick in hand. The work of local sculptor Kenneth Potts, it was unveiled on 22 March 1985. The blue plaques in Worcestershire were set up on the centenary of A Shropshire Lad in 1996. In September of the same year a memorial window lozenge was dedicated at Poets' Corner in Westminster Abbey The following year saw the première of Tom Stoppard's play The Invention of Love, whose subject is the relationship between Housman and Moses Jackson. As the 150th anniversary of his birth approached, London University inaugurated its Housman lectures on classical subjects in 2005, initially given every second year then annually after 2011. The anniversary itself in 2009 saw the launch of a new edition of A Shropshire Lad, including pictures from across Shropshire taken by local photographer Gareth Thomas. Among other events, there were performances of Vaughan Williams' On Wenlock Edge and Gurney's Ludlow and Teme at St Laurence's Church in Ludlow. Collected Poems (1939); the poems included in this volume but not the three above are known as Additional Poems. The Penguin Edition of 1956 includes an Introduction by John Sparrow. These lectures are listed by date of delivery, with date of first publication given separately if different. ^ "Housman's 150th birthday". BBC. Retrieved 12 January 2017. ^ P. G. Naiditch. "A.E. Housman at University College, London: The Election of 1892". Retrieved 31 December 2017. ^ Richard Perceval Graves, A. E. Housman: The Scholar-Poet Charles Scribners, New York (1979) pp. 52–55. ^ Blocksidge, Martin. A.E. Housman: A Single Life. N.p. : n.p., 2016. Print. "Housman became an atheist whilst at Oxford..."
^ Ricks, Christopher (1989). A. E. Housman. Collected Poems and Selected Prose. Harmondsworth: Penguin. p. 18. ^ J. Roy Birch and Norman Page, ed. (1995). Unkind to Unicorns. Cambridge: Silent Books. ^ a b Collected Poems Penguin, Harmondsworth (1956), preface by John Sparrow. ^ Summers ed. 1995, 371. ^ Arthur Eaglefield Hull, A Dictionary of Modern Music and Musicians Dent, London (1924), 73. ^ Palmer and Banfield 2001. ^ A.E.Housman, Classical Scholar, Bloomsbury 2009, N. Hopkinson, "Housman and J.P. Postgate"
^ "History of the ASCR". UCL. Critchley, Julian, 'Homage to a lonely lad', Weekend Telegraph (UK), 23 April 1988. Housman, Laurence. , De Amicitia with annotation by John Carter. Encounter (October 1967, pp. 33–40). Wikimedia Commons has media related to Alfred Edward Housman.